One of the most important lessons I learned while traveling for long periods of time was to continue looking at the world with a new set of eyes. To always be curious and live as if each moment was an adventure waiting to happen. Of course, it's quite simple to do this when one is traveling across the country, seeing new physical places, faces --tantalizing each sense with new smells, tastes, and cultural experiences. But, why should it be any different when one is stationary? For those that aren't traveling, it can be easy to forget the beauty, the 'oohs' and 'aahs', while the adventurous soul takes a little hiatus. Therefore, I challenge you today to wipe your slate clean. Forget that it's the same old cubicle you are going to each and every weekday. Forget that you're taking the same old route to work - - fighting traffic to get there on time. No one ever said you can't pretend it's an adventure, right? Take a different route to work. Say hello to some new faces. Get excited about the fact that you're alive. And that you're breathing, fully capable of making new friends, trying new foods on your lunch break, and finding something to laugh about. Don't ever forget it's up to you to have an adventure, anytime - - anywhere. Don't be a tourist. 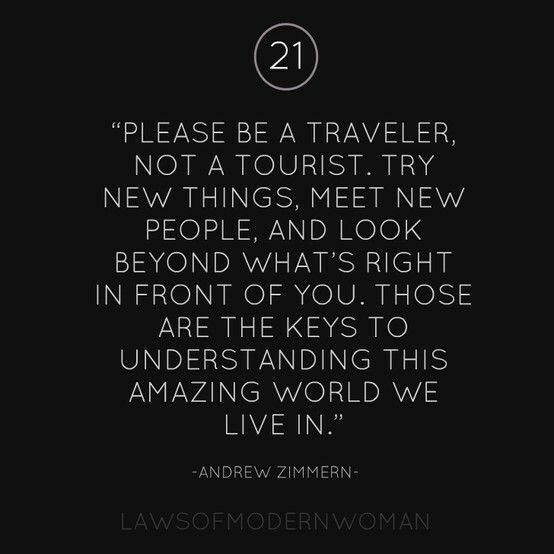 Be a traveler in your everyday life! Its a challenge worth accepting. You definitely do have a glow around you when you're on the road and people do feed off that. I know that Sydney being as international as it is does take away the novelty value I had whilst abroad. Its about getting out there though, building that momentum until it becomes infectious. I'd love to recapture that, its there to be found. I accept the accept the challenge! Wonderful thought Cathy. So true and so beautiful and so worth trying! yay i love reading these quotes! Great post! Whenever we travel, I avoid the tourist traps and gravitate to where the locals are. It's the only way to really "feel" a place!